Nearly 400,000 Americans suffer out-of-hospital cardiac arrests every year, and almost 90 percent die because they don’t receive immediate CPR from someone on the scene. When begun immediately, CPR can double or triple a person’s chance of survival. The American Heart Association is on a mission to teach people across the country how to save lives with Hands-Only™ CPR with the help of 70s disco classic, “Stayin’ Alive” by the Bee Gees. If you see a teen or adult collapse, call 9-1-1 and push hard and fast in the center of the chest to the beat of the classic Bee Gees' song "Stayin' Alive." The American Heart Association's Hands-Only CPR at this beat can more than double or triple a person's chances of survival. To learn more about the Hands-Only CPR campaign and tour, hustle to heart.org/HandsOnlyCPR, facebook.com/AHACPR or youtube.com/HandsOnlyCPR. 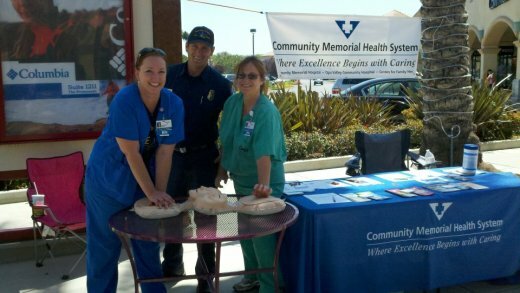 In June 2012, Ventura County Emergency Medical Services Agency coordinated a "Sidewalk CPR" event in over 2 dozen locations throughout the County. Another Hands-Only CPR event at 10 locations is planned for Tuesday, June 4, 2013. Check for responsiveness - shake and shout. Rub the breast bone with your knuckles. Call 9-1-1 or tell someone to do so - if unresponsive and gasping or not breathing. Compress: Position on the floor face up. Place one hand on the center of the chest and the other hand on top of the first. Push HARD (at least 2 inches) and FAST (about 100 times per minute). Continue until Emergency Medical Services arrives, even if the person gasps. Gasping is not a sign of recovery - it's because you are doing a good job with CPR. You may just save a life with this knowledge.